Discharged merc tends to remain behind the electrode. 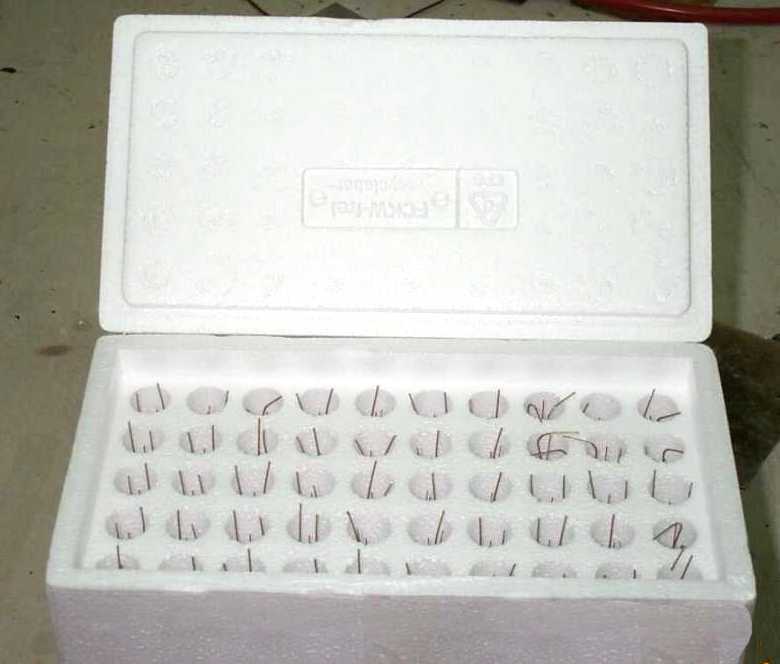 This is the electrode with the various parts identified. 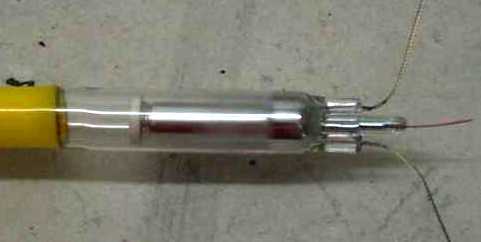 The mercury is contained within a capsule that is placed in the electrode glass where the tubulation would normally go. This is a very clever arrangement that requires very little tooling change. 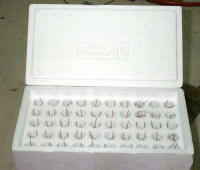 The electrode itself is a conventional ceramic collar unit. Production note: After struggling for longer than I care to think about trying to get a good photo of this electrode, it dawned on me that a transmission photo might work. I placed the electrode on a light box and the above photo resulted. A tip to keep in mind when trying to photograph a glass-encased object. Here is the electrode attached to some tubing. This photo was taken on the light box but with a little fill flash to bring out detail. In this photo the mercury capsule is being fired. 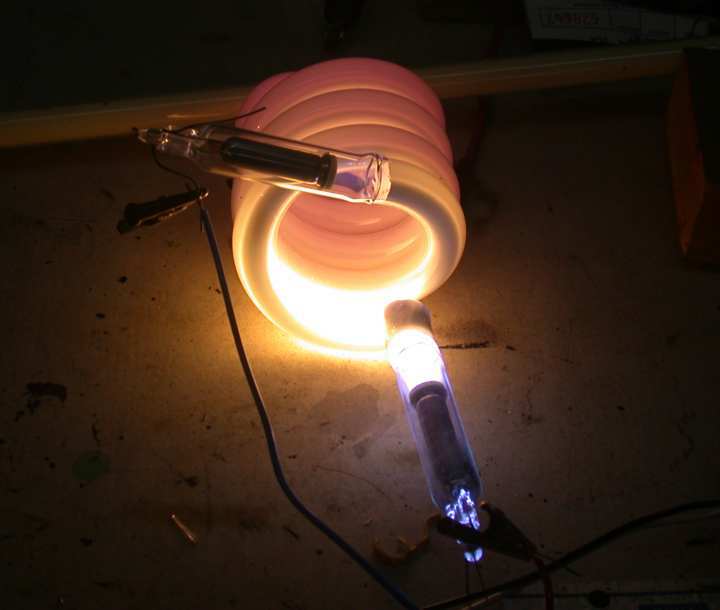 The capsule electrode is connected to a 60 ma transformer. 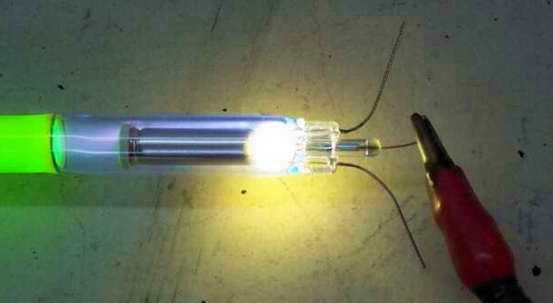 The other transformer lead is attached to the other end of the tube. It can also be connected to the merc electrode lead. This shot shows the second problem with these electrodes. 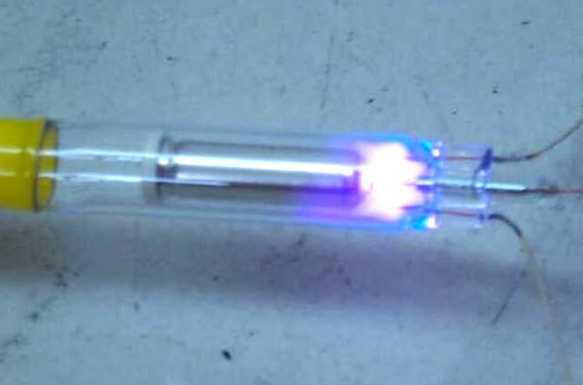 Likely as not, the mercury emits as a mist or vapor and plates out on the end of the electrode. This mercury is effectively lost to light production. I address this problem by strongly heating the electrode with a heat gun. This drives the merc out to the main tube. It, of course, adds an extra processing step. Here is the electrode after the merc capsule has been fired. The interior structure of the mercury capsule can be seen. The QuickSilver is a great idea that is crippled by poor implementation and by playing to certain fads within the industry. In particular, the theory that only a couple of milligrams of mercury will do the job. The lack of mercury is the core of most of the problems. 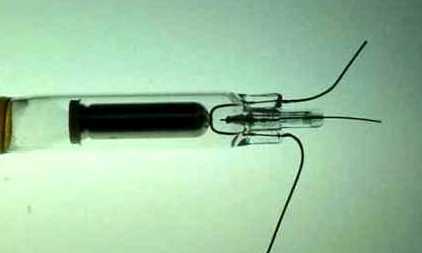 If the capsule contained two or three times as much mercury then the electrode would be useful in production for long tubes. As it is, I only use these electrodes on short tubes, no more than about 3 ft long. Any longer and the tube is either starved for mercury or it takes forever to work the mercury throughout the tube. Even if the mercury can be coaxed throughout the tube, there is no cleanup reserve. 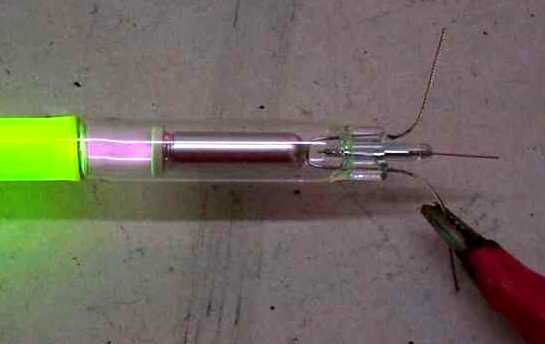 This means that even though the tube looks good in the beginning, as it consumes mercury it will dim. I have had some success on moderate length tubes using a QuickSilver on each end of the tube. This works but it doubles the (significant) electrode cost plus it requires the tube to be side tubulated.